A ball-jointed doll is any doll that is articulated with ball and socket joints. 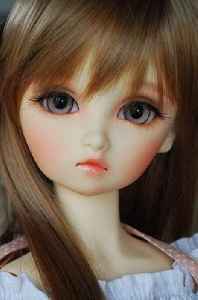 In contemporary usage when referring to modern dolls, and particularly when using the acronyms BJD or ABJD, it usually refers to modern Asian ball-jointed dolls. These are cast in polyurethane synthetic resin, a hard, dense plastic, and the parts strung together with a thick elastic. They are predominantly produced in Japan, South Korea and China. The BJD style has been described as both realistic and influenced by anime. They commonly range in size from about 60 centimetres (24 in) for the larger dolls, 40 cm (15.5 in) for the mini dolls, and all the way down to 10 cm (4 in) the very smallest BJDs. BJDs are primarily intended for adult collectors and customizers. They are made to be easy to customize, by painting, changing the eyes and wig, and so forth.